Considered one of the NHL’s leading injury reserves for the All-Star Game in Ottawa on Jan. 29, Flyers forward Scott Hartnell could still be on the outside looking in despite open spots. With injuries to selected All-Stars, Minnesota Wild’s Mikko Koivu and Dallas Stars’ Jamie Benn, Hartnell, who is having a career season with 19 goals and 19 assists in 43 games, might still be behind unheralded but buzz-worthy Phoenix Coyotes forward Radim Vrbata, who has 22 goals and 15 assists in 45 games. Helping Vrbata jump on the All-Star map is his three goals and assist in his last three games. Another option to consider is the promotion of another Wild player in Koivu’s wake. Winger and former Senator Dany Heatley has been tagged as the only other consideration with 13 goals and 17 assists in 45 games. The move would also provide valuable drama to an otherwise drama-less event, as Heatley demanded a trade out of Ottawa in late 2009, causing immense bad blood with the city and its fans. Florida Panthers forward Kris Versteeg could also be a name on the table, with 17 goals and 22 assists in 42 games. Whether he’s residing in the East or out on the West Coast, some things never change for Anaheim Ducks coach Bruce Boudreau. 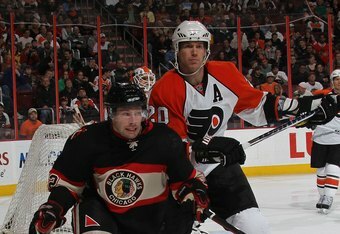 Regardless of where he’s behind the bench, he doesn’t like or respect the Flyers. On Saturday, after his Ducks debut was spoiled on Friday night at the Honda Center with a 4-3 comeback overtime win by the Flyers the night prior, Boudreau couldn’t help but commend his club for some good things, discuss the emotional week, and oh yeah, trash the Flyers for diving. For nearly every team in the playoffs, home-ice advantage has been a crucial and desired aspect in gaining an edge on the opposition. However, for the Flyers, their strategic advantage comes as the visitors. On Friday following the Flyers’ afternoon practice, the players all equally shrugged off the shutout home loss to the visiting Buffalo Sabres in Game 1. The mantra followed by the still-confident group was one of ‘we played well enough to win’ and ‘we’ll get them on Saturday’. And while the lack of concern for their Game 1 defeat may seem counterproductive, the Flyers are focusing squarely on the crux of the entire series — Game 2. VOORHEES, N.J. — In Thursday night’s hair-pulling 1-0 loss to the Buffalo Sabres in Game 1, the Flyers racked up 35 shots and 74 total attempts at goalie Ryan Miller. Yet, they still want and need more. The Flyers and Chicago Blackhawks don’t have a particularly fiery competitive history. In fact, the Hawks are one of the few long-running franchises that doesn’t have a natural or festering hatred for the Orange and Black, and likewise. However, despite lacking long-running contempt, the lone regular season battle between the two Stanley Cup finalists on March 13 still lives in the nightmares of Hawks coach Joel Quenneville. Even after getting their nose bloodied in a 5-1 loss to the Montreal Canadiens at the Bell Center on Thursday in game 3 of the Eastern Conference Finals, the Flyers have reason to be optimistic about a turn around in game 4. And that reason is easy — they are not happy.